Base Notes - Tonka Bean, Musk, Vanilla And Amber Lavender, the bedrock of men?s perfumery, wears its universal credentials beautifully. Aromatic and enigmatic the opening is familiar yet unusual all at once. Basil, white cinnamon and black pepper ensure the introductions. A feeling of altitude recounts the heights (above 1000ft) at which Penhaligon?s Lavandula grows. Here it is in excellent company, sage and lily of the valley strike a soft green accord. Like all fine compositions the contrasts create balance. Now we swoop close-up onto skin for the intimate sensations of vanilla, musk and amber. Because lavender reassures, comforts, brings calm and this robust but smooth woody floral is no exception; whilst being truly exceptional. Lavandula - Sensual, hypnotic, yet still clear headed. High basil, canella and pepper rise over mid-range lavender, lily and clary sage, then deeper resonances of musk, vanilla, amberwood and tonka bean. Made in England. Size: 100ml / 3.4 fl oz natural spray. Lavender, the bedrock of men?s perfumery, wears its universal credentials beautifully. Aromatic and enigmatic the opening is familiar yet unusual all at once. Basil, white cinnamon and black pepper ensure the introductions. 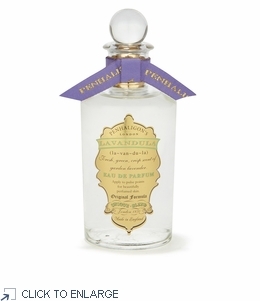 A feeling of altitude recounts the heights (above 1000ft) at which Penhaligon?s Lavandula grows. Here it is in excellent company, sage and lily of the valley strike a soft green accord. Like all fine compositions the contrasts create balance. Now we swoop close-up onto skin for the intimate sensations of vanilla, musk and amber. Because lavender reassures, comforts, brings calm and this robust but smooth woody floral is no exception; whilst being truly exceptional.